Forty-five years ago today — September 12, 1966 — astronauts Charles “Pete” Conrad, Jr. and Richard F.Gordon, Jr., launched from Cape Canaveral on the Gemini-11 mission. Gemini-11 mission objecttives were “to achieve a first orbit rendezvous and docking with the Agena target vehicle, to accomplish two ExtraVehicular Activity (EVA) tests, to perform docking practice, docked configuration maneuvers, tethered operations, parking of the Agena target vehicle and demonstrate an automatic reentry.” The 3-day mission also carried several experiments. Gemini-11 marked the first time two tethered spacecraft were rotated to impart a gravity-like acceleration. 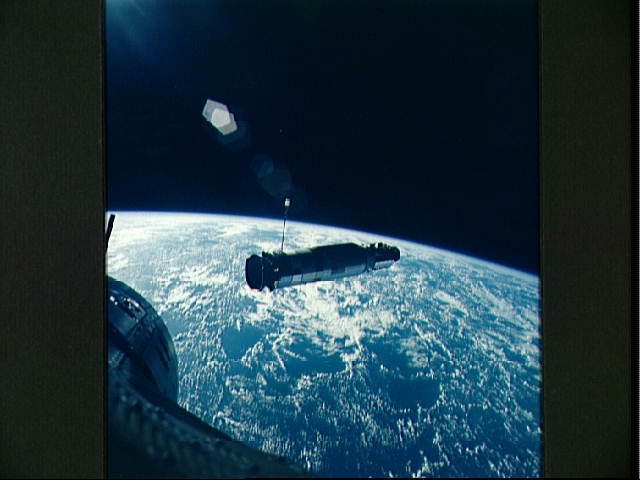 The hatch was closed at 9:57 a.m. [on September 14] and shortly afterwards the spacecraft were undocked and Gemini 11 moved to the end of the 30 meter tether attaching the two spacecraft. 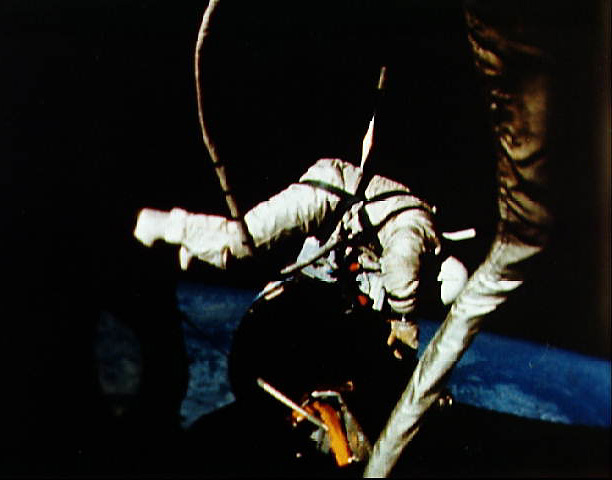 At 11:55 a.m. Conrad initiated a slow rotation of the Gemini capsule about the GATV which kept the tether taut and the spacecraft a constant distance apart at the ends of the tether. Oscillations occurred initially, but damped out after about 20 minutes. The rotation rate was then increased, oscillations again occurred but damped out and the combination stabilized. The circular motion at the end of the tether imparted a slight artificial “gravitational acceleration” within Gemini 11, the first time such artificial gravity was demonstrated in space. After about three hours the tether was released and the spacecraft moved apart. Twenty-five years later, on this date in 1991, the Space Shuttle Discovery launched from the Kennedy Space Center on mission STS-48. Astronauts John O. Creighton, Kenneth S. Reightler, Jr., Mark N. Brown, Charles D. Gemar, and James F. Buchli deployed the Upper Atmosphere Research Satellite (UARS). 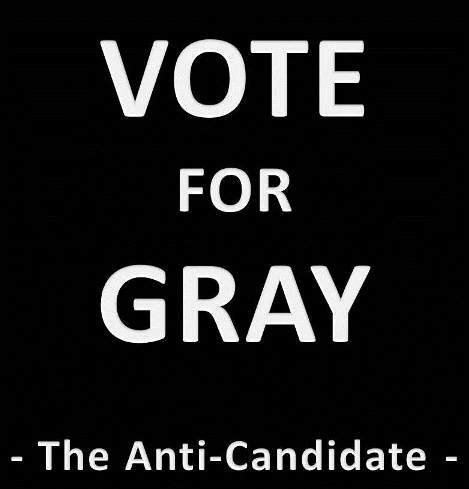 UARS was designed to operate for three years, to “make the most extensive study ever conducted of the Earth’s troposphere, the upper level of the planet’s envelope of life sustaining gases which also include the protective ozone layer.” The spacecraft was decommissioned in December 2005. Unfortunately, UARS has been in the news recently: the 14,500-pound observatory is expected to fall back to earth later this month in an uncontrolled reentry. Forty-five years ago today — July 18, 1966 — John W. Young and Michael Collins launched from Cape Canaveral on the Gemini-10 mission. 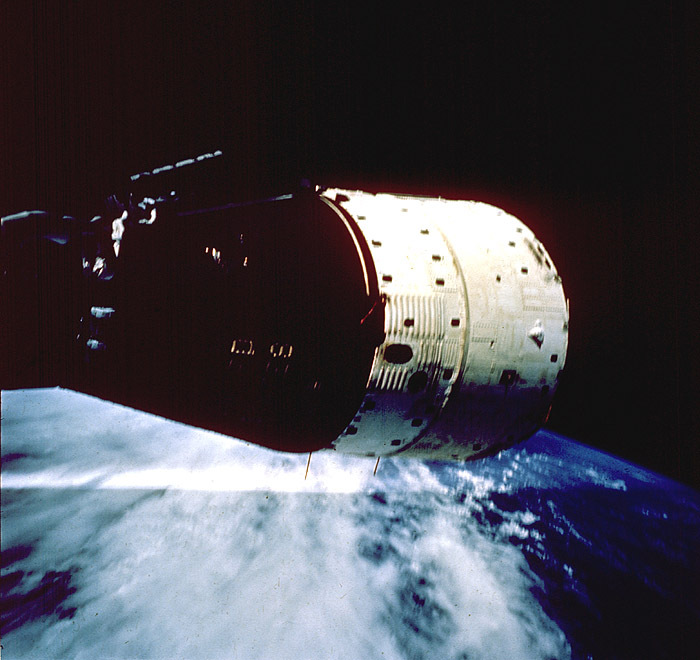 Gemini-10 featured the first dual space rendezvous: Young and Collins rendezvoused with two target vehicles, Agena-10 and then Agena-8. In fact, Gemini-10 first docked with Agena-10, and then the astronauts moved the entire dual-spacecraft assembly into the orbital rendezvous with Agena-8. 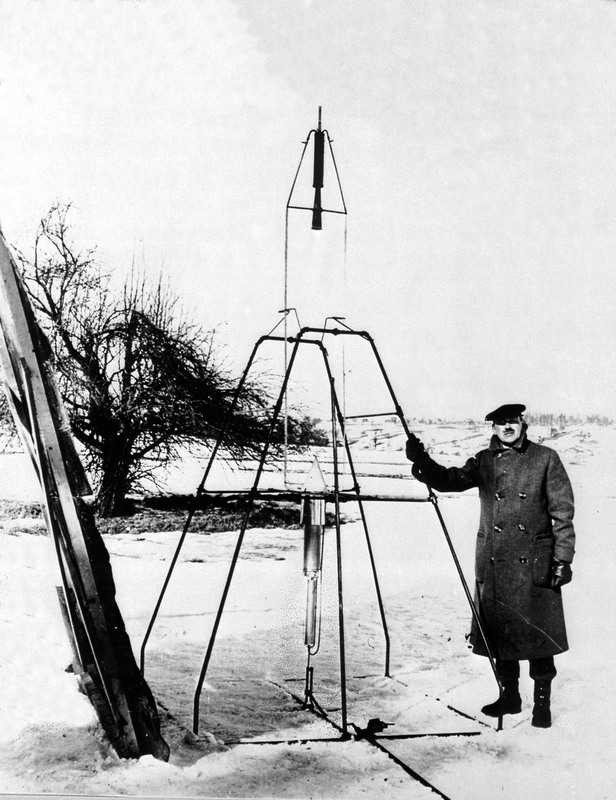 Despite difficulties due to lack of handholds on the target vehicle Collins removed the fairing and retrieved the micrometeoroid detection equipment. During the EVA he lost his camera. He also retrieved the micrometeorite experiment mounted on the Gemini 10 spacecraft, but this apparently floated out of the hatch and was lost when Collins reentered the capsule. Overall, though, the Gemini-10 mission was successful: Young and Collins splashed down on July 21st, having completed another step in the pathfinder checklist on the way to the Moon. Forty-five years ago today — December 15, 1965 — astronauts Walter M. Schirra, Jr. and Thomas P. Stafford launched from Cape Canaveral on the Gemini VI-A mission. First radar lock indicated a distance of 396 km. Two more major thruster burns preceded the final braking maneuver at 2:27 p.m. EST. Rendezvous was technically achieved and stationkeeping begun at 2:33 with the two Gemini spacecraft in zero relative motion at a distance of 110 meters. Stationkeeping maneuvers involving the spacecraft circling each other and approaching and backing off continued for 5 hours 19 minutes over three and a half orbits. Forty-five years ago today — December 5, 1965 — astronauts Frank Borman and James A. Lovell, Jr. were orbiting the earth in their Gemini capsule. 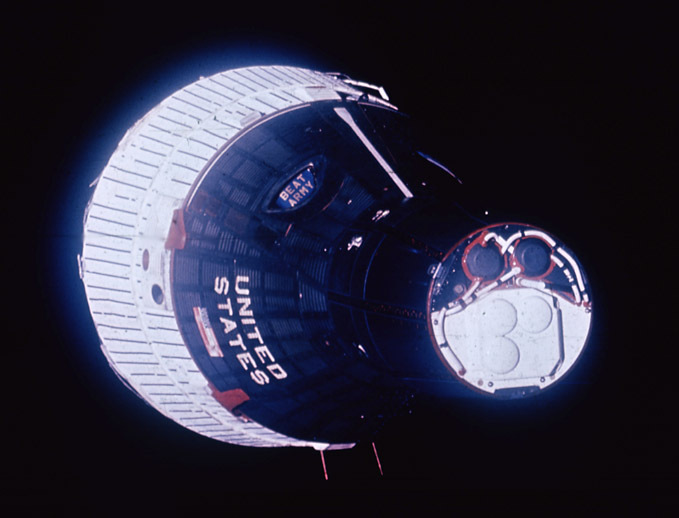 Borman and Lovell spent 2 weeks in orbit, and performed the first space rendezvous with Gemini-6, which was supposed to launch first but was delayed by a problem with its Titan booster. Stationkeeping maneuvers involving the spacecraft circling each other and approaching and backing off continued for 5 hours 19 minutes over three and a half orbits. During the maneuvers, all four astronauts on both spacecraft took turns in the formation flying activities and photographs were taken from both spacecraft. This marked the first time two spacecraft were maneuvered with respect to each other by their crews. Read more about the program at this Gemini history page. Forty-five years ago today — August 21, 1965 — astronauts Gordon L. Cooper, Jr., and Charles P. “Pete” Conrad, Jr. launched from Cape Canaveral on the Gemini-V mission. 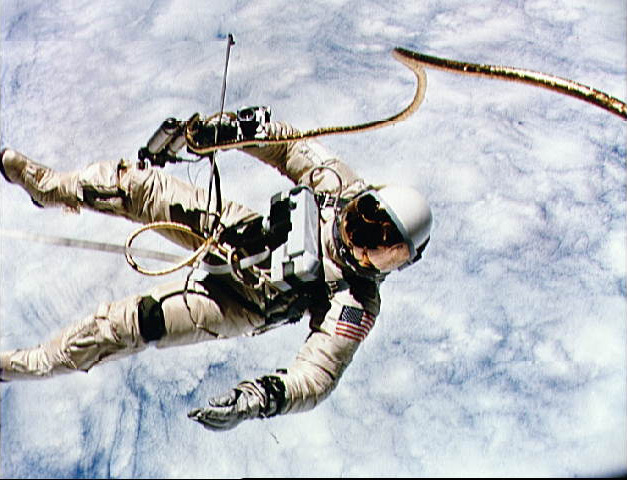 Cooper and Conrad spent eight days in space, evaluating the effects of prolonged weightlessness and testing rendezvous capabilities and maneuvers in advance of the Apollo missions to the Moon.